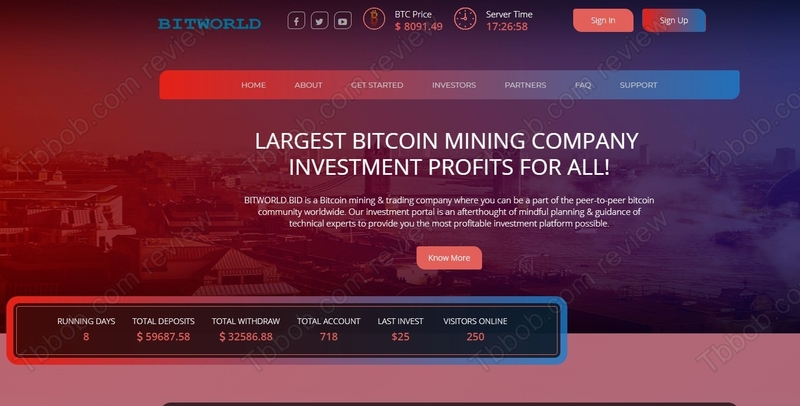 Bitworld is supposed to be a Bitcoin mining and trading company. It offers several investment programs with returns up to 103% per hour! Can you really double your money every hour with Bitworld? We’ve reviewed hundreds of investment scams, so we have seen a lot of dirty things and tricks, but Bitworld really must be the most absurd scam we have ever looked at. 103% per hour on your investment is such a nonsense that we hope that nobody can trust Bitworld. In Bitcoin mining and trading you won’t be able to double your money in a month, so an hour is really absurd. Bitworld claims to be a company registered in the UK, on the website you will even find a picture of the certificate. But it is fake. As you can see on our image, the certificate with this number belongs to another company. And Bitworld of course is not licensed to provide investment services either, it is a totally illegal operation. The true nature of Bitworld is a Ponzi scheme. Often Ponzi schemes pay profits for some time, because they use new deposits for this purpose until the system collapses. But with Bitworld we doubt they will pay anything, because 103% per hour is so unsustainable, that it probably is just a way to take money from people and never pay anything. It is a total scam. Bitworld is a scam that cannot last even days, don’t consider investing it, if you don’t want to lose your money. If you are interested in making money in Bitcoin trading, try it on a free demo account with a regulated broker to see what the possibilities are. Be sure to understand all the risks associated with trading before you eventually decide to invest real money.